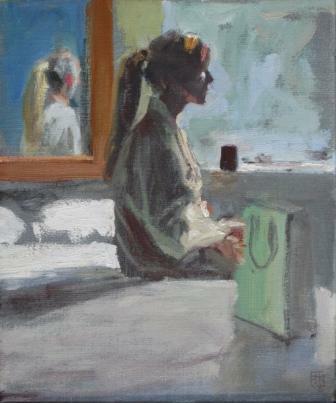 In ''Harveynix'' David Cobley explores the power of light and shade and reflection. We see the young model more clearly in her reflection, as her figure is shaded. David Cobley is fascinated with the human form. He says: "My paintings are almost entirely about the figure - the human form as it is illuminated, as well as concealed, by the light that falls upon it or around it. Using the effects of light, painting can create the illusion of solid form in space; while at the same time blur distinctions between the two. David Cobley was elected a member of: Royal Society of Portrait Painters in 1997; New English Art Club in 2000; and Royal West of England Academy in 2001.